Although 87 percent of California households are reported to have broadband Internet connectivity at home, a growing segment of underconnected residents’ only means of connecting to broadband is through a smartphone. 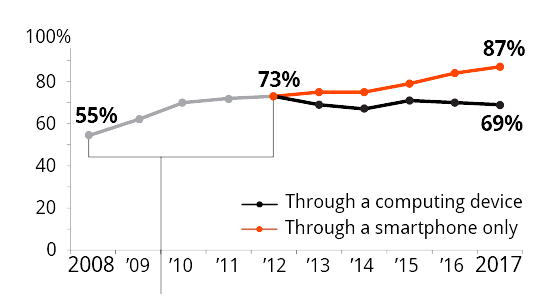 The trend among California households with broadband internet shows that connectivity through computing devices has plateaued, while smartphone connectivity is increasing. * Results based on small sample size. ** Broadband connectivity among seniors age 75 or older is lower, with 49 percent connected through a computing device and 9 percent through a smart phone only, totaling 58 percent. From making travel plans on the go, to solving complex math equations for AP calculus class, our smartphones have become a device we cannot live without. Part of what makies this tool so invaluable are the multitude of applications out there designed to do almost any task. Some of the apps listed below you may already be familiar with and some may even surprise you.